This My Personal ATM Money / Coin Bank with Digital Display is the perfect gift for your kids to start learning about saving. Make saving money fun for your kids with the Digital ATM Coin Money Bank . 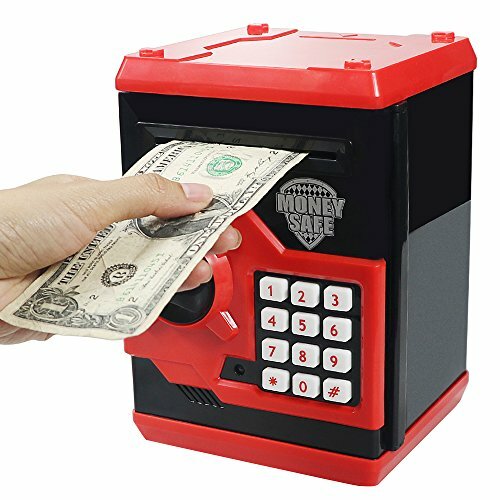 Teach children about the importance of saving with this pretend Money Box. The coin slot recognizes the denomination of each coin helping to keep track of account balances. Notes can also be deposited and the keypad can be used to update the amount on the account. This Bank also has in-built functions such as time, 24 hour clock, date, alarm, calculator and ATM sounds and tunes for a realistic experience. Children can even set saving targets and check the display to see how many days or money is still needed to reach their goals. The in-built alarm will sound should any sticky hands try to steal the savings from your personal Coin Bank! As Ben Franklin says, "a penny saved is a penny earned". Teach kids about money while they have fun at the same time. 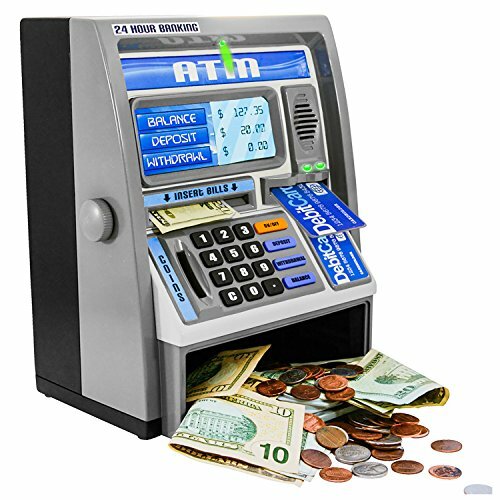 This ATM style electronic savings bank works with real money (bills and coins), talks, and totals your account balance. Insert the special bank card and the bank comes to life. Make a deposit or make a withdrawal and the ATM will ask you to enter the numbers and report your account balance. 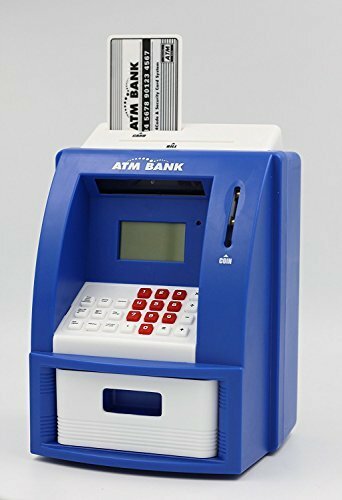 For deposits, roll bills into the feeder with the twist knob, enter the amount deposited or enter coins and the ATM will calculate and report your new account balance. For withdrawals, enter the amount to withdraw and the ATM will report your new account balance. Kids learn the value of a dollar and "money cents". Includes special bank card and instructions. Suggested for ages 5 and older as a STEM teaching toy. Works with most currencies. Original and official Ben Franklin Toys brand. 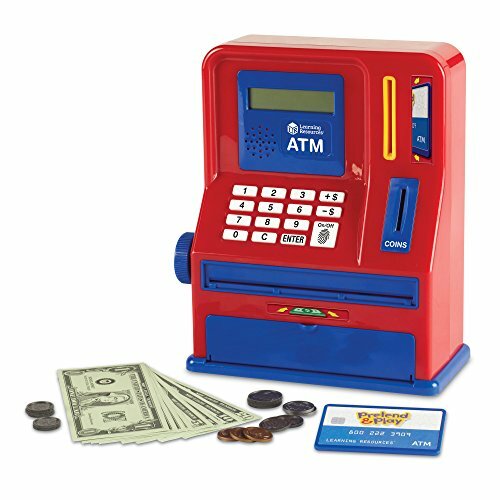 Kids can lean money management early with thiselectronic teaching ATM. 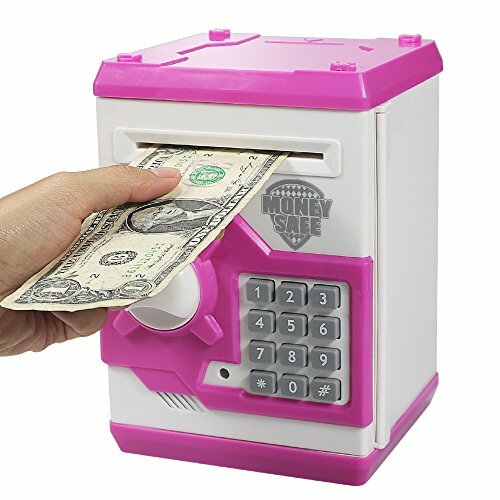 Kids will have hours of fun counting, depositing, withdrawing, and saving with both real and pretend money. Features coin recognition, a mechanical bill feeder, and a pretend thumbprint sensor. Includes play money and ATM card. Large LCD screen measures 2½”L x 2”H. 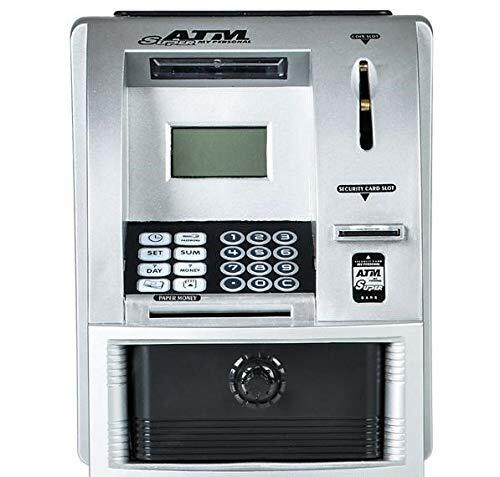 ATM measures 9½”H. This automated ATM bank helps children learn money management as they maintain a savings account. 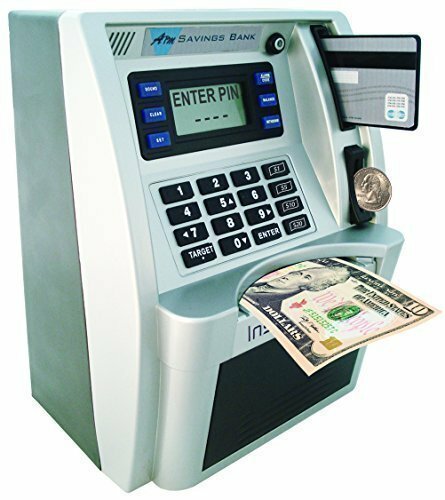 The machine accepts real coin and bill deposits up to $999.99 and displays accurate, up-to-date account information on its screen. 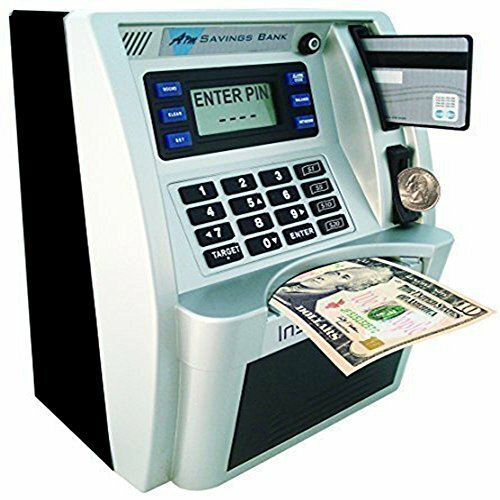 Account holders interact with the teller via the control panel, and have their own ATM card and PIN for checking their account balance, making deposits, or withdrawing funds. Preferred by a panel of parents and children, this model was confirmed The Best in tests. It has a large, clearly labeled keypad for easy operation, unlike lesser models with small buttons and confusing markings. Includes a digital alarm clock. For U.S. currency only. Requires three AA batteries. Ages 5 and up. One year warranty. Shopping Results for "Atm Bank Machine"